Crafting Queen: Getting my Mojo back! Hope you all are having a a great weekend! I have been sick this entire week and still recovering from a horrible viral! But yep a bit better and stronger enough to make a card or two :) I really like the Mojo Monday sketch...aptly it got my Mojo back and the PDCC -"just a splash" was quite interesting! So here is what i came up with :) This is one of my first Rossette and i loved it....gonna make more! I kinda liked how it turned out. This is very bhalo... Love the BG....and those butterflies are so tiny.. had to take my specs out...!! Such a lovely flower. your folds are all so even!! I struggle there! karuna this is just gorgeous just love it. 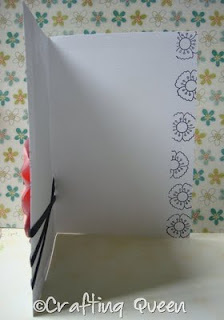 so beautiful stamping and the flower is just so perfect. Wow fabulous creation deary. Like the Color combo too. This is very pretty Karuna... !! Lucky is the one whoz gonna receive it ! 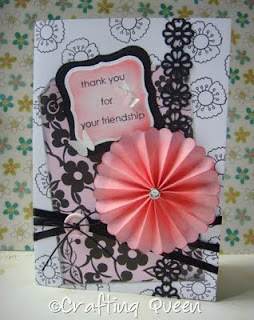 Your rosette looks gorgeous and your card looks so good. Awesome take on the Mojo sketch and what a beautiful rosette, in such a beautiful color! Great take on the splash, as well...Thanks for playing along with us at the Play Date Cafe! I love the colour of your pink rosette, it's so pretty! Great job with our colours! Thanks for playing along with us over at The Play Date Cafe this week! Thanks a lot for playing along at CrafyJC Challenge.